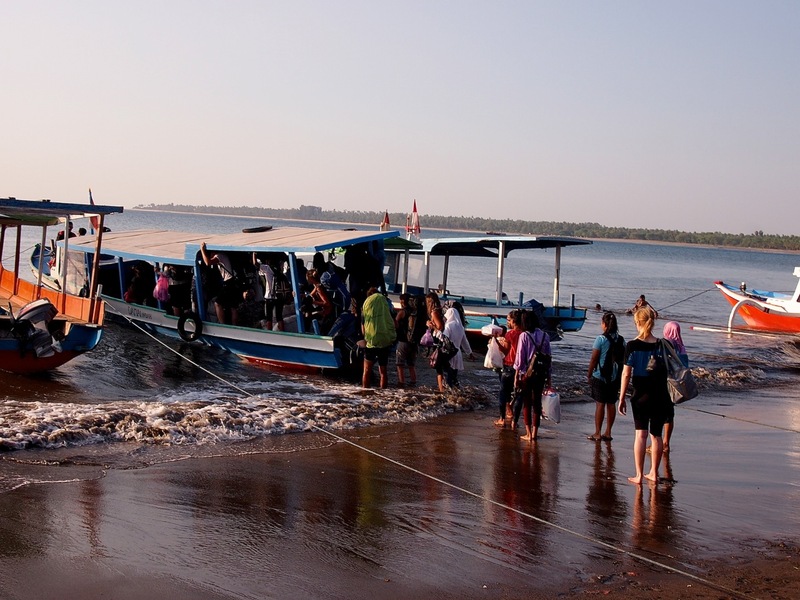 If you have more time than money, or you want to see the “real” side of Bali and Lombok, then getting to the Gili islands from Bali to Lombok on the public ferry makes for an interesting journey. But there’s a few things that other travel sites don’t tell you about this budget-friendly way of getting to Lombok to Bali, then onto the Gili islands. 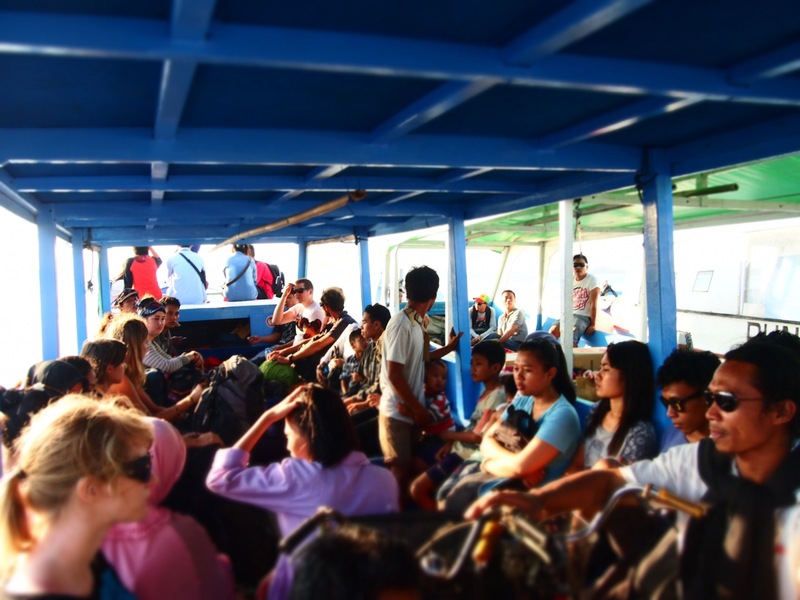 Here’s everything you need to know about how to get to the Gili islands from Bali on the public ferry from Padang Bai to Lombok, and from Bangsal harbour to the Gili islands. Your journey begins at 9am in Padang Bai. Spending the night in this transient port town is highly recommended. By day, crowds of tourists getting on, and off the fast boats between the Gili islands and Bali zip right through the place, but only few spend the night here. So, as busy as this port town makes itself out to be by day, when the last fast boat from the Gili islands offloads passengers at Padang Bai’s harbour, its charming beach falls utterly quiet and desolate. Most travellers arrive in Padang Bai from Kuta in the morning, but if you’ve spent the night here, you can amble onto the public ferry terminal at about 10am. You’ll see a ferry approaching the harbour, then it takes about an hour to turn around and head back to Lombok. The ferries run every 1.5 hours throughout the day, and night. The journey takes approximately 4-5 hours, depending on sea conditions. The public ferry from Bali to Lombok costs just IDR40,000 versus IDR450,000 each way on the fast boat. Here are a few vital tips (that we learned the hard way). Get on the ferry early. The seats fill up fast in the seating galleries, with both bodies and bags. An iPod and noise cancelling earphones are a must. As soon as the boat leaves the harbour, choruses of crying babies go off, and don’t stop until Lombok. Have a good breakfast in Padang Bai. The 4 – 5 hour journey is long, and the snack bar on the ferry sells a limited range of instant noodles and unhealthy snacks. 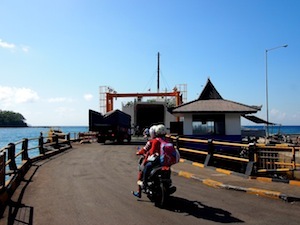 From Lembar ferry terminal in Lombok, you’ll have to get private transport to Bangsal harbour. There are no meter taxis here, so you’ll have to strike a deal. Remember that Lombok prices are lower than Bali. We paid IDR200,000 for the 1.5 hour drive. 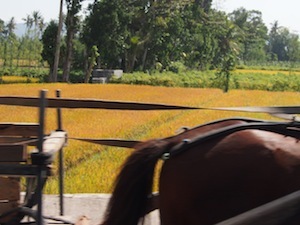 Zipping through Lombok in the car is a great way to see Lombok’s scenery. Stretches of rice paddies and corn fields carpet the hilly terrain on both sides until you reach the city centre of Mataram. Beyond Mataram you’ll ride along the steep valleys of Monkey Forest. You might want to stop here and take a few photos. You should arrive at Bangsal harbour at 4pm. Don’t panic if you’re running a little late. The public boats don’t leave till 5pm realistically, as they wait for the seats to fill up before they take off to the Gilis. The public boat ticket office is near the beach, to the right of the harbour and past the small row of warungs. Tour guides might try to sell you tickets for IDR75,000. The tickets on the public boats cost less than US$1, so purchase your ticket at the counter. In the event that the boats are full when you turn up, you should still be able to find a traditional outrigger boat to take you to Gili Air, the closest Gili island to Lombok for US$10. Also to note, these humble public boats are packed to the rafters with people and island supplies. If you’re travelling light, it should be no problem. But if you’re totting around a large case, it’s just not going to work. All being well, you’ll arrive in the Gili islands in time for a sundown dip in the ocean and a well deserved dinner under the stars. I’m planning to visit Gili in September. Thank you for the tips! The font on your web page is extremely difficult to read especially for tired old eyes. Please consider a darker and thicker font with less graphics. Do you have to go to lombok from padang bai in order to go to any of the gili islands? or can you go straight there? Hiya we want to go from Lombok to Gili T and we are poor backpackers ! Does anyone know the cheapest way!? Is it taxi to the ferry then ferry to Gili t!? I got dropped off in padang bai by scuba tour from amed (saved on transport from kuta). 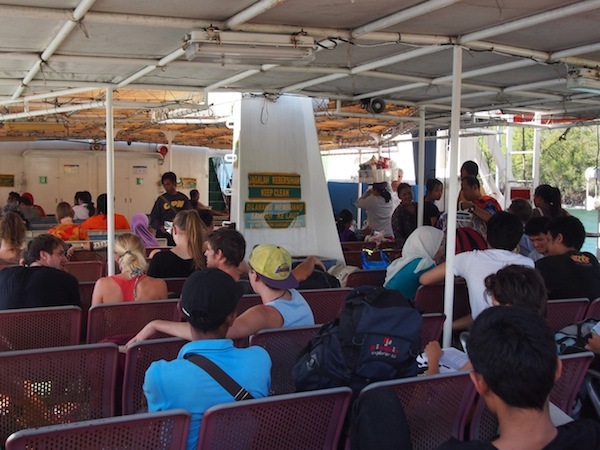 Apart from that I have seen plenty of shops offering the slow option for 200,000 – public ferry to lembar and shuttle buses all the way up to bangsal harbour and the ferry across to the gilis. This option would take around 7 hours. This may be the easier option if you a solo traveller, as all I have read from getting to lembar to bangsal by bemos or taxi to be a lot of hassle. This option may mean paying a fraction more than doing it all yourself, but at least it is minimal hassle. If you are travelling as a group of 2/3 and still want to keep it cheap and you cant get the fast boat price down, from what i have read – pay for the public ferry yourself to lembar, get the hell out of the harbour without even talking to any of the people trying to sell you stuff in the harbour and negotiate a price with one of the blue bird taxis waiting a few hundred meters up the road. I really hope this helps people as I have found it hard to find any decent information. Matt Arat, you are not really helpful, 150.000 pp for a fast boat is great price, I tried to haggle down the price 7 August and it is impossible, so your advice is no longer accurate. Blue taxis should be with the meter and not negotiated. Please don’t say you have the cheap option as you went by speed boat, you are not a real backpacker, you are as I say a taxi-backpacker.